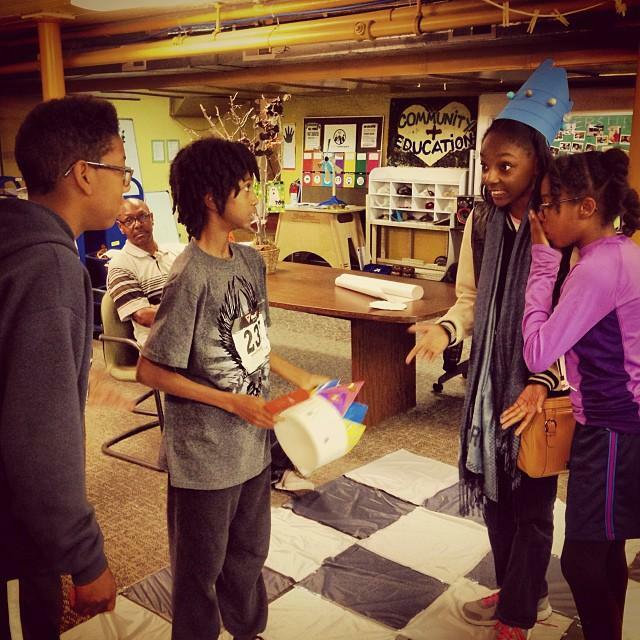 Young makers play a game of life-size chess at Detroit’s Mt. Elliott Makerspace. The game is life size. With young people acting as the pieces. Charles is the bishop. Sakoo’s the knight. Raven’s the queen, and she’s wearing a handmade, blue paper crown to prove it. The kids also made the chess board, out of black and white, plastic shower curtains. I asked Raven, the queen, how she’d be spending her time if she didn’t know about the Makerspace. In a room next door to the chess game, 6th-grader Chris Price puts the finishing touches on a silver dirt bike. He learned how to put together what was once a just a bunch of parts and components, so he gets to take this bike home for free. “And I’m lucky cause I don’t have to spend no 20, or 30, or 40 dollars to fix a bike. It’s just free if you help on it,” Price explains. Of course there is some money involved. Local foundations, primarily Kresge, have been supporting the project since 2010. They’ve helped pay for things like the woodshop, silkscreening studio, 3d printer, and computer lab. “We have a lot of children in this neighborhood, and there are not a lot of recreation centers. The library is not very close to here. So we needed a Makerspace, someplace they could come and get involved and they would be in a safe environment at the same time”, says Oyin Zuri, a volunteer at the Makerspace. Church of the Messiah, which houses the Makerspace, sits in the heart of Detroit’s Islandview neighborhood, not far from Belle Isle. Earlier this year, Islandview was ranked the second most dangerous neighborhood in America. That means, according to an analysis of FBI crime stats, there’s a 1 in 7 chance of becoming a victim of violent crime over the course of a year. Pastor Barry Randolph says Islandview is a lot more than that. He lives in an apartment above the church and is involved with pretty much everything that happens here. “Islandview is a community that’s on the verge of greatness and making it happen with very few or limited resources. We’re gonna change the nature of the community. We’re gonna go out and make it tangible. We have to change the mindset of the people that’s in the neighborhood,” Randolph says. Of course, that’s a lot easier said then done. But that’s the whole point of Makerspaces. And now, there are a handful of them in Detroit. Spaces where residents can fix old lawnmowers to start landscaping businesses. Or experiment with wind turbines and solar panels to explore possible alternatives to expensive utility bills. Or simply, these are spaces to go on a rainy day when there isn’t anything else to do. These are the community centers of the future.